With an impressive growth record in this industry, we are manufacturing a wide array of SS Tank Vessels. 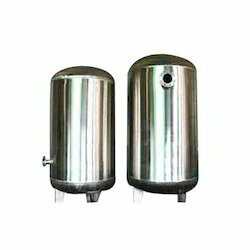 We are offering wide range of stainless steel tank trolley. We are using high quality of raw materials to fabricate the SS Tank trolley. We are providing this trolley as per the client specifications. We are engaged in offering a qualitative range of S.S Vessel with M.S. Jacket. These are widely appreciated by our clients for optimum quality and durability. Our range is designed as per the industry specific requirements and manufactured using high grade raw material. These are greatly acclaimed for its capability to easily withstand extreme working conditions. Our range of material handling equipment also includes vessels, which are constructed using premium grade mild steel and stainless steel. Used in diverse industries, our vessels are known for leak proof and ability to withstand high pressure. Made of Stainless steel (304 / 316 Q.) 14 / 16 / 18 gauge with welding done by argon arc process. with lid, outlet / inlet valve. M. S./ S. S. Stand with castor wheels etc. Option: Above can also be supplied with Dished End Bottom or Conical Bottom as requirement. 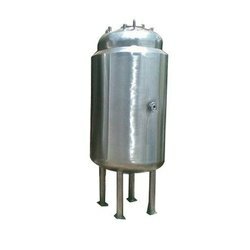 - The Water Phase Vessel is a jacketed cylindrical tank with torrispherical dish ends. Professionals work hard and provide this SS 316 Hygienic Storage Vessel. This storage vessel is accessible from us in as per need for production work. We deals in Stainless Steel Vessels . We are a leading provider of 20 Litre SS Vessel. Specialized GMP standard stand alone plants & vessels are our specialization. We also manufacture condensers for various distillation plants, petrochemicals, solvents etc. Extensive quality checks are done prior to dispatch.